Located quietly below the village of Neochori with marvelous views over Stoupa and the Messinian Gulf. 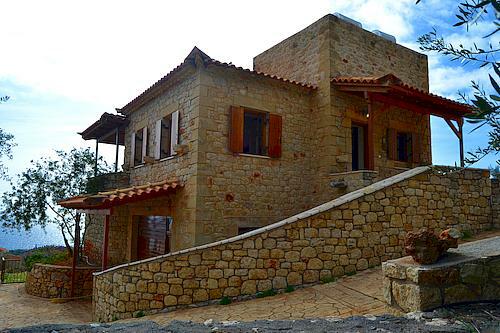 The 'Lithospitia' (Lithos=ancient Greek for stone, Spitia=houses) were built in 2006. As it is about 1500 meters to Stoupa's main beach, some kind of transportation is useful. The road to Neochori passes close by but due the elevated position of the houses the road isn't disturbing and the arrangement offers tranquility and privacy. The three detached buildings are intelligently arranged to provide most privacy and on the balconies you can peacefully enjoy the fantastic sunsets. The building in the middle has two similar holiday apartments for up to 3 persons. The other two houses have a separate sleeping room and are suitable for a maximum of 4 to 5 people. The houses and apartments are equipped very comfortable, they are fully air-conditioned, a TV and WiFi is available and the fully equipped kitchen provides everything needed for self catering. Own parking exists directly at the houses.